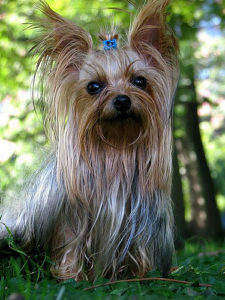 The healthy skin of the Yorkshire Terrier is light pink, smooth and there is no irritation or cracking in the skin. Yorkies have very sensitive skin and a minor issue might cause a serious problem. If you are concerned about the skin of your Yorkie, then there are multiple ways to identify that if your dog’s skin is healthy or not? What are the major causes of the Yorkshire Terrier skin problem? One of the major reasons for the Yorkie’ skin problem is its long coat that is a huge barrier to the normal air flow. You can keep the skin of the Yorkie healthy by grooming the coat on a daily basis or give a new cut hairstyle to your dog. Excessive bathing may also cause skin problem to your dog, so take special care that what type of shampoo you are using for the dog as well as water temperature. Water with moderate temperature is best for your dog because too hot water may cause skin irritation. Another reason for skin irritation is allergy which can be caused by various reasons such as digestive problem, tears from the eyes of the dog and running nose. How to prevent the skin problem? To avoid any kind of skin issue, it is better to visit the veterinarian on a regular basis that includes flea’s inspection as well. Another important thing is to eliminate all bad food from the dog’s diet such a colored food, snacks, etc. Prefer bottled water instead of tap water. If your Yorkie has dry skin, then give Omega 3 on a daily basis at least for three weeks. Aloe Vera is very beneficial to cure the itching and skin irritation of the Yorkshire Terrier. You just need to rub it on the skin of the dog to get positive results.